For my daughter's 3rd birthday, I made a fire truck cake. The design of the cake was strictly for her - she loves fire trucks! The inside of the cake, however, was a little bit selfish because I chose what went inside. Really, my daughter doesn't care, as long as it's sweet. I decided to do something similar to our wedding cake, which I don't remember the exact flavors of since I only got one bite, but I remember that everyone raved about it. Anyway, this is my take on what was in it...or at least what I think was in it. It's a very rich cake, so you only need a small piece...and a big glass of milk. I made a chocolate cake and filled it with whipped ganache, almonds, chocolate, and caramel. On the bottom layer of cake, spread whipped ganache then sprinkle with almonds. Drizzle with melted chocolate chips and caramel. Place another layer of cake and repeat as many times as desired. Sorry, I chose a bad piece to get a picture of. The layers kind of ran together, but it still tasted good! 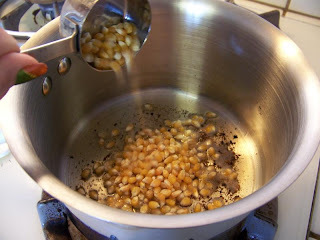 Combine butter, brown sugar, corn syrup, and sweetened condensed milk in a heavy saucepan; bring to a boil over medium heat, stirring until the sugar dissolves. Carefully stir in the heavy whipping cream. Continue cooking until it reaches 238 degrees, or the softball stage. During this time, you'll want to refrain from stirring, otherwise you'll end up with grainy caramel! Once it hits 238, remove it from the heat and add the vanilla and salt. Pour it into a bowl to cool. It's important to let it cool before putting it on a cake, especially if you're putting it on a whipped ganache, as it will just melt the ganache if the caramel's still hot. Now that thanksgiving is over, we really should be post healthy, low-fat, low-calorie recipes for a little while before we get into the Christmas recipes. But I've had quite a few requests for this recipe, and we like to keep our readers happy. 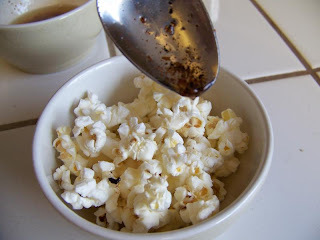 This recipe came about after our dad made a comment about how a childhood friend (or college roommate or cousin's boyfriend...I can't really remember) of his used to eat popcorn. He said they used to drizzle bacon drippings over it as we usually do with butter. And since everything is better with bacon, I just had to try it. But drizzling flavor on popcorn means there is some left without. So I started using the bacon grease to pop the popcorn on the stove. Every kernel gets flavored! Some warnings. Bacon grease burns more easily than vegetable oil. Use a lower heat than you normally would. Also, bacon grease has a tendency to spatter. Keep kids away from the stove when popping bacon popcorn. In large pot, melt bacon grease over medium heat. Add popcorn kernels and shake pan to distribute. 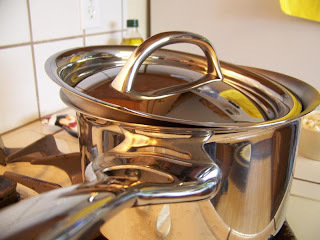 Cover pot with lid slightly ajar to let steam escape but not so much that grease spatters everywhere. After popping has started, carefully shake pan occasionally. 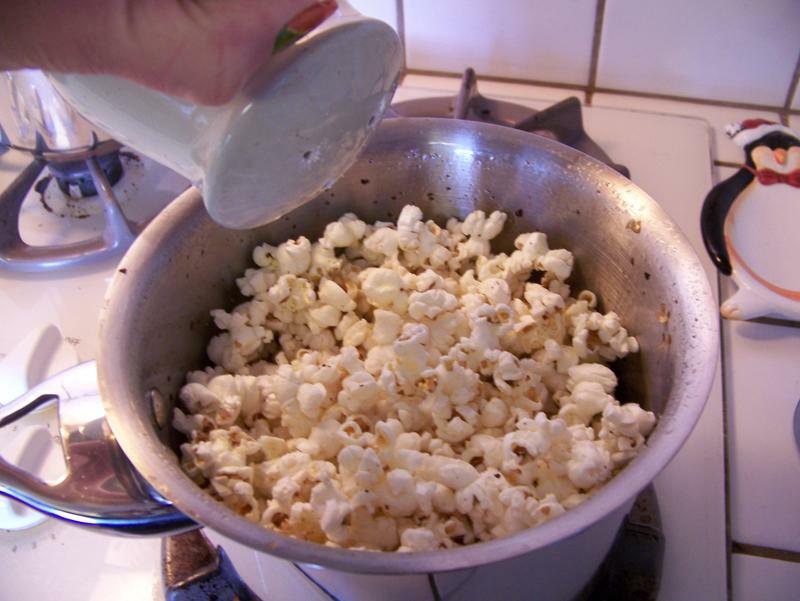 When popping slows down, remove from heat. Add salt, return lid, and shake to distribute salt while holding lid on. As we pause from our busy lives to reflect upon our blessings and thank God for all His mercies, we'd like to thank all of you, our loyal readers! What started as chit chat between two sisters has blossomed into a year-and-a-half food adventure. Our readership continues to grow, mostly due to all of you sharing Near to Nothing with your friends and family. So thank you very much! And since this is a food blog, we have to have a recipe. Position April between Mommy and Aunt. Place puckered lips of Mommy and Aunt on cheeks of April. If you like April sandwiches, you should also check out April burritos! I have a Thanksgiving confession: I could do without the turkey. It’s not that I don’t like turkey, because I do enjoy it. But I’d rather fill my plate with the side dishes. I just love stuffing, green bean casserole, and mashed potatoes! We are not hosting Thanksgiving dinner this year, so we are only providing one dish. I asked Robbie which of my classic Thanksgiving dishes he wanted me to make, and he requested my mashed potatoes. My goal when making mashed potatoes is to make them so flavorful that no butter or gravy is needed. These really are Thanksgiving mashed potatoes and not everyday mashed potatoes. A lot of the flavor comes from butter, cream cheese, and sour cream, and never the low-fat or fat-free versions. And I never add milk. Yummy, but not the healthiest. I always use Russets. Not only are they the cheapest potatoes, but the mealiness produces a great texture in the finished product. I leave the skins on (adds a little more nutritive value), but feel free to peel them. If I plan ahead, I like to use roasted garlic. If I don’t have any garlic roasted ahead of time, I use fresh garlic. Sometimes when I’m really pressed for time or out of fresh garlic, I use garlic powder. Fresh chives definitely contribute better flavor than dried chives, but they are expensive. I have garlic chives growing in my herb garden so I just go out and snip them fresh. Regardless of what kind of garlic or chives you use, the absolute key to really good mashed potatoes is to taste as you go. It actually kind of frightens me to put this recipe in writing, because I always make my mashed potatoes by the taste-and-adjust method. And remember, you can always add more, you can’t take away, so start out conservatively and add in small increments. Wash and peel potatoes if desired. Cut potatoes into chunks. Boil until tender; drain. Place butter and cream cheese in same pot while it is still hot. Pour potatoes back into pot. Add sour cream, garlic, salt, and pepper. Mash with potato masher until desired texture. Stir in chives. Taste and make necessary adjustments, adding more sour cream for a thinner consistency. One of the things that makes Thanksgiving Thanksgiving and Christmas Christmas is Chocolate Chip Pumpkin Bread. We grew up eating it every year for Thanksgiving and Christmas, and it continues to be one of our favorite holiday treats. The recipe we usually use is a secret, so I'm not sharing the recipe we grew up with. Sorry! However, I did find a recipe that is very similar to the one we grew up with, and I even made a couple small changes to make it even more similar. It still isn't exactly the same, but it's pretty close and I think you'll like it! One of the nice things about this recipe is that it's versatile. You can make large loafs, mini loafs, muffins, or mini muffins. You'll just need to adjust the baking time depending on what you're making. Grease and flour bread pans or muffin tins (or line muffin tins with cupcake wrappers). In a large bowl, combine sugar, pumpkin, vegetable oil, water, and eggs; mix well. Add flour, cinnamon, nutmeg, baking soda, and salt. Mix until combined, being careful not to over mix. Gently fold in chocolate chips. Pour batter into prepared bread pans or muffin tins. Makes 1 large loaf or 3 small loaves. I honestly can't tell you how many muffins or mini muffins it makes, as I've never counted. Sorry!!! If you're making muffins, fill each muffin tin 2/3 to 3/4 of the way full. For 1 large loaf, bake for 75 minutes, or until a toothpick inserted in the center comes out clean. For 3 small loaves, bake 50-60 minutes. I don't have the times for the muffins, but next time I make them, I'll let you know! Waiting patiently for the bread to bake! Sometimes it doesn't come out of the pan very well. It could be due to the fact that I've reused these disposable bread pans so many times. Maybe it's time to invest in some real bread pans! Yum! So moist; so delicious! Before Kimiko and I were married, with families of our own, we spent every Thanksgiving with Doris, our Near to Nothing grandma’s cousin. Now that we try to split our holidays with in-laws, unfortunately we only get to spend about every other Thanksgiving with her. Yes, our great grandmother still has living cousins! One of Doris’s specialties is cranberry-orange relish. I am generally not a cranberry person, so I usually pass on the relish. But everyone else always raves about it! And I can tell you, it definitely looks a lot better than that can-shaped gelatin stuff. As I was making this the other day, the boys were watching me and tasting ingredients. To my surprise they really liked the fresh cranberries by themselves. When it came time to try the finished product, they were both very hesitant, almost refusing. But as soon as the first little morsel hit their tongues, their mouths turned up in huge smiles, and they gulped down the rest of the spoonful. The key (and benefit) to this recipe is that it should be made the day before. Not only does the resting time let the flavors meld together and mellow out, but who doesn’t appreciate a make-ahead Thanksgiving dish? I made mine on Monday—that’s a week-and-a-half before Thanksgiving. No problem! I just tossed it into the freezer and will put it back in the fridge a day or two before the big feast. Place orange pieces, cranberries, and pineapple if using chunks in food processor. Pulse until chopped to desired texture. Transfer to bowl. Stir in crushed pineapple if using and sugar. Refrigerate overnight. Yield: about 5 cups. ...a colorful, appetizing turkey accompaniment. Thanksgiving Is Right around the Corner!! 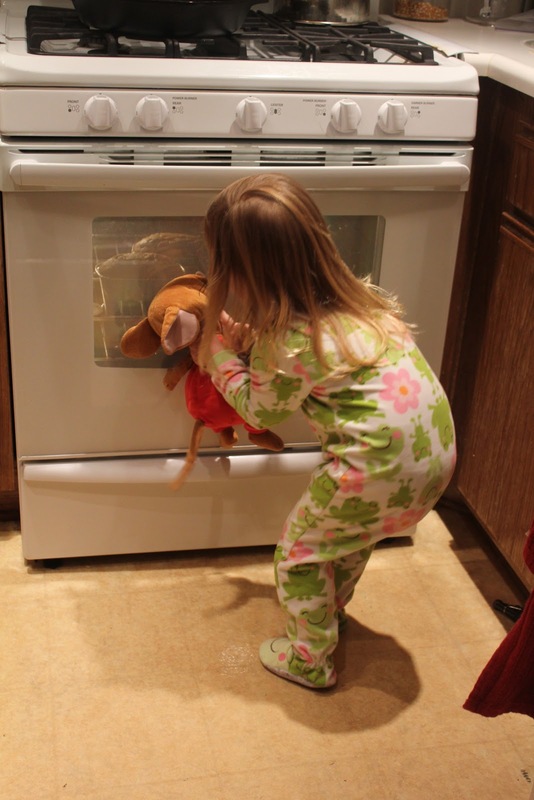 A frozen turkey always takes longer to thaw than you would think. You can find turkey tips here. If you are hosting, be willing to accept help. When someone asks, "What can I bring? ", don't let your pride get the better of you. Avoid saying, "I've got it covered." Every dish someone else prepares is one less thing on your shoulder. If you are going to someone else's house, ask what you can provide and get it as table-ready as possible before arriving. Keep in mind fridge and oven space will be limited. Take your cold dishes in an insulated carrier with ice packs. Heat your hot dishes at home and take them in an insulated carrier with heating pads. Let the kids help! Set them up with age-appropriate jobs like peeling potatoes, cutting vegetables, setting the table, making table decorations and place cards, answering the door and taking coats. 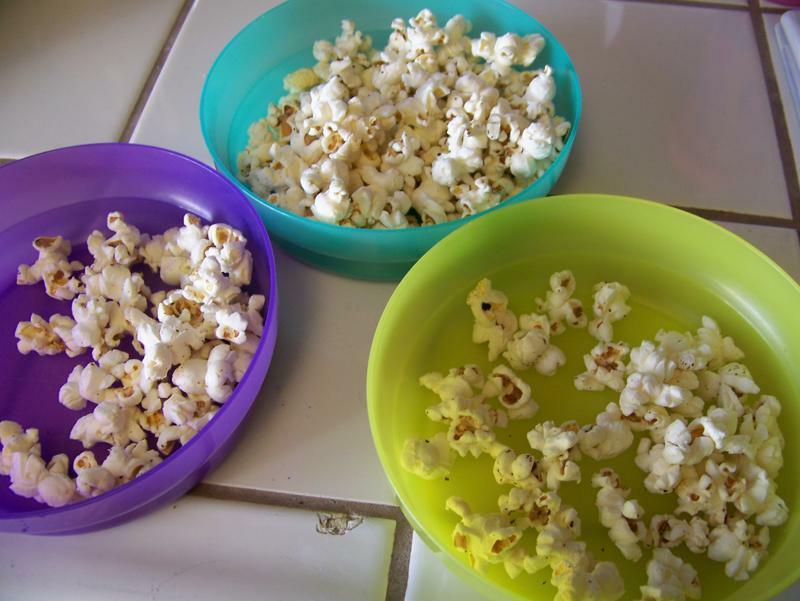 Not only will this keep them occupied, it will teach them about the work that goes into a family gathering. Plan and do ahead so you can get out of the kitchen and spend time with your family. Don't get wrapped up in having the "perfect" Thanksgiving. Turkey overdone? Pie crust not flaky? Kids spill gravy on your carpet? It's all part of the experience. Enjoy the day. Be thankful you have kids/nieces/nephews/grandkids with whom to share a meal and spill things on your floor. Above all, remember to give thanks to the One from whom all blessing flow! To help you out, we've provided links to our previous Thanksgiving recipes. We will continue to post more, including our family's cranberry-orange relish, so be sure to keep checking back! This is the pizza I made when I tried my new pizza dough recipe a couple weeks ago. Let me tell you, the pizza was even more amazing than the crust!! Let me give you a bit of a caveat though, it's not friendly on the waistline. Most pizza isn't low calorie, but this kind especially isn't low cal. It is so yummy, though, and a nice treat every once in a while. If you like Papa Murphy's Gourmet Garlic Chicken Pizza, this is apparently very similar. Spread pizza dough on pizza pan or stone. I don't have a round stone or pan, and I've found pizzas don't always bake well on my rectangular stone, so I made 4 smaller pizzas. Combine ranch dressing and garlic; spread over crust. I didn't use all of the sauce I had mixed and I thought it tasted great, but that may be because mine was a different size. Combine cheeses; sprinkle half of cheese mixture over sauce. Layer chicken, tomatoes, and green onions; top with remaining cheese. Bake 12-15 minutes, or until cheese is bubbly and crust is slightly browned. If you wait for a sale, you can usually find ranch dressing quite cheap. Buying blocks of cheddar and mozzarella cheese is usually (but not always) cheaper than buying it shredded. Blocks of Parmesan cheese are much more expensive than buying the non-refrigerated grated (almost powdery) kind. The powdery kind works well in this recipe. Look for a good sale (I often get it for $1.85/lb or less) on boneless, skinless chicken breasts and/or use leftover chicken from another meal. Preparing the chicken using Sumiko's method will add extra flavor to your pizza. When cooking the chicken, be careful not to overcook it, otherwise it will get very dry when you bake the pizza. It's not tomato season, but if you watch the ads, you may be able to find a good sale on them. Where I live, I can often get them for 33 cents/lb or less. Thanks to Tammy for the recipe. Check out her pizza making tips here.